Additional Information: Savannah is a thoughtful, mature, and talkative young lady. She enjoys spending her free time doing arts and crafts, painting, reading, cooking, singing, and playing board games. 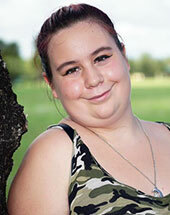 Savannah also loves to chat and appreciates someone who will listen and with whom she can share stories. Her favorite foods are shepherd’s pie, chicken, pizza, shrimp and steak. In school, she loves math and hopes to attend college in the future. She has two sisters and a grandmother with whom she would like to maintain contact. Savannah would do well in a home with other children. She is excited about adoption and hopes her forever family has a dog.